Junkyard emergency of biblical proportions! 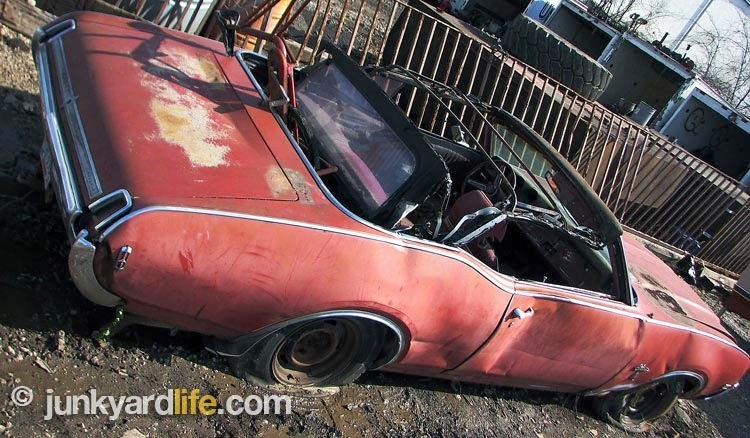 Junkyard Life brother, Keith Lively, has done the impossible. 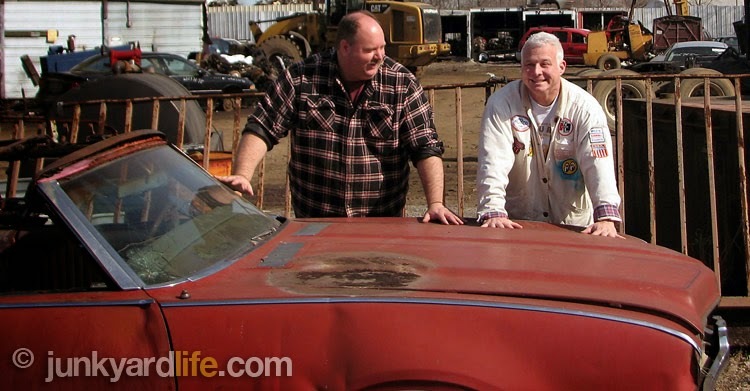 Forget flying or time travel, this guy BOUGHT an entire car from a scrap yard! The official records will read that he did not buy a car, he bought every single part of the car. How many times have we tried to do that and got the obligatory negative head shake and a hand pointing at the door? “Junkyard Emergency!” an excited voice yelled on the other end of my phone. I knew this was serious business. So, I dropped everything and bee-lined to the scrap place. And look what I found. Keith Lively sitting on, guarding if you will, his bounty and new thing to do. A 1969 Oldsmobile Cutlass convertible! Keith’s father, with trailer in tow, and I arrived at the same time. It was my turn to stand guard while they sealed the deal. My hands were plastered against the convertible as they made it all official with the scrap yard. Sold! Consider this baby rescued. Good finally wins over evil. Finally, the car guys triumph over scrap prices. 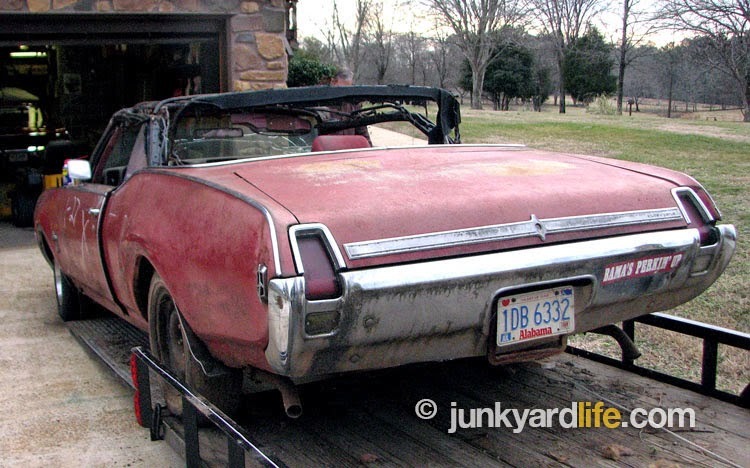 Keith Lively rescued this 1969 Olds Cutlass convertible from an Alabama scrap yard. 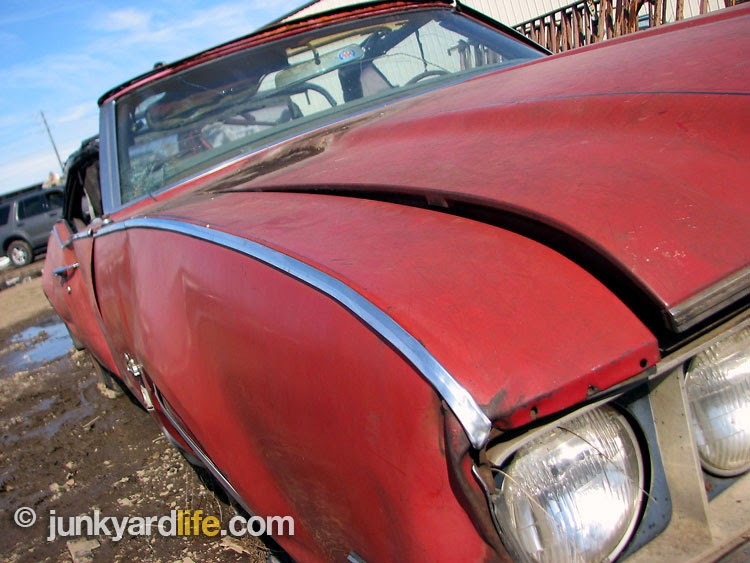 He plans a total resto-mod on the rough-but-complete, Crimson Red rag top. What does he have here, really? Keith has what I suspect to be a triple red Cutlass S convertible with an Oldsmobile 350-cu. inch V-8. The drop top is well-optioned with power brakes, power steering, air conditioning, bucket seats, with (dig this) no console. That’s right, it has a column shifter and buckets. Keith and I refuse to believe someone simply added buckets and didn’t have a console to install. No, the seats appear to match perfectly to the back seat. Almost forgot to mention the solid, rust-free frame and 12-bolt rear end out back. The treasure chest gets heavier when you consider a very unusual 3-spoke Sport steering wheel optioned on the Oldsmobile. You find a lot of “base model” steering wheels, which almost appear to be upside down or you may be lured to the sporty appeal of the famous 4-spoke Sport Wheel. The Oldsmobile dorks over here at Junkyard Life have not seen many of these way cool, 3-spoke steering wheels in Keith’s ’69 Cutlass. The red rag top has the upscale Cutlass S trim on the fenders extending all the way down the royal sides of this drop top. It seems to have the original paint (code 52 Crimson Red). The hood? Oh, my. It has the “S” or Supreme hood that also made an appearance on the 442’s of the 1969 model year. We love that hood. 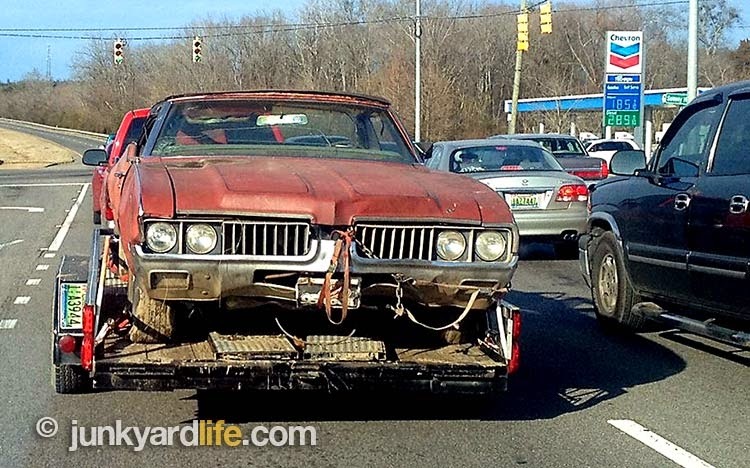 How many of the 13,498 Cutlass convertibles built are still around? Peek at the rare 3-spoke wheel. Note the column shifter and the bucket seats. What doesn’t he have here? The drop topper has no radiator and does not have the original wheels. Boo-hoo. We can take care of that in short order. 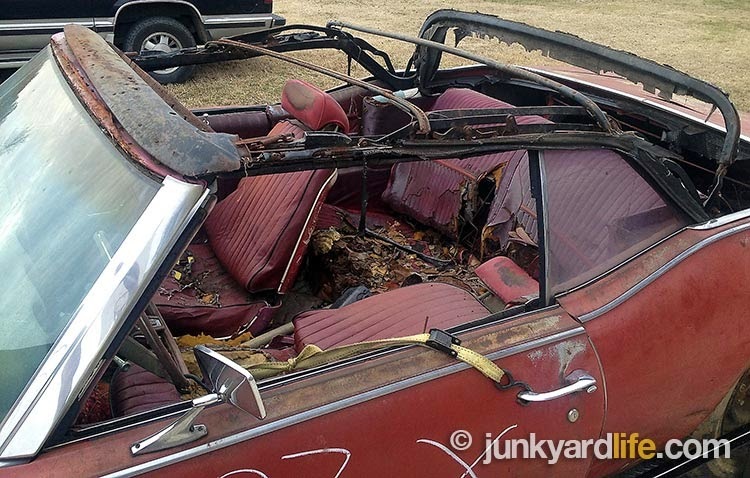 The frame for the convertible top and the mechanisms appear to be in good shape, although the material is long gone. Loaded up and trucking home with the latest project. 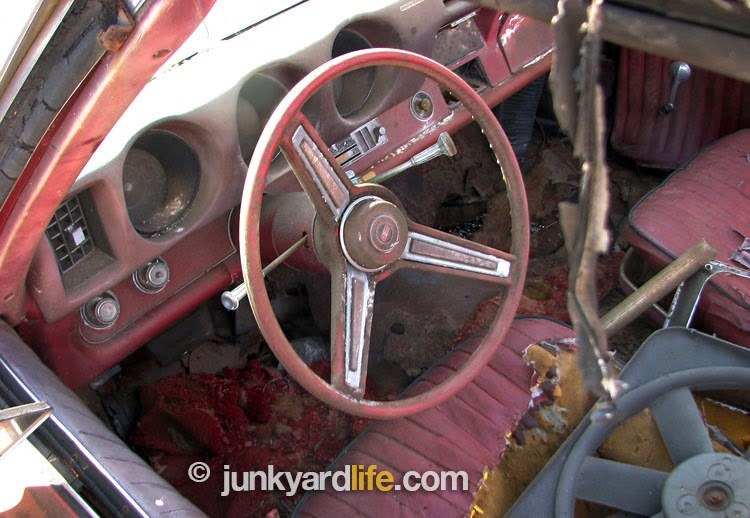 Junkyard envy? We welcome this addition to the family of Junkyard Life Oldsmobiles we have rescued and played with. This rare Olds has fallen into good hands and the end of its life story is about to be rewritten. Good stuff. Great negotiating skills and a real life, “I can’t believe this!” story. We will start on this car after we can finally stop high-fiving each other. 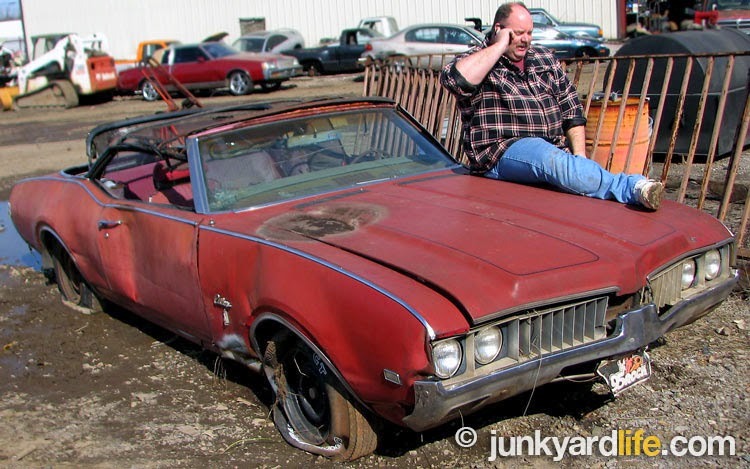 Keith Lively, left, and Ron Kidd, right, assume the “hands-on-don’t touch-my-car” position while guarding the prized, scrap yard ’69 Cutlass convertible. Big dent in the Cutlass passenger door is the result of a forklift moving the car at the scrap yard. Original 350-cu. inch Olds engine under the hood, we think. 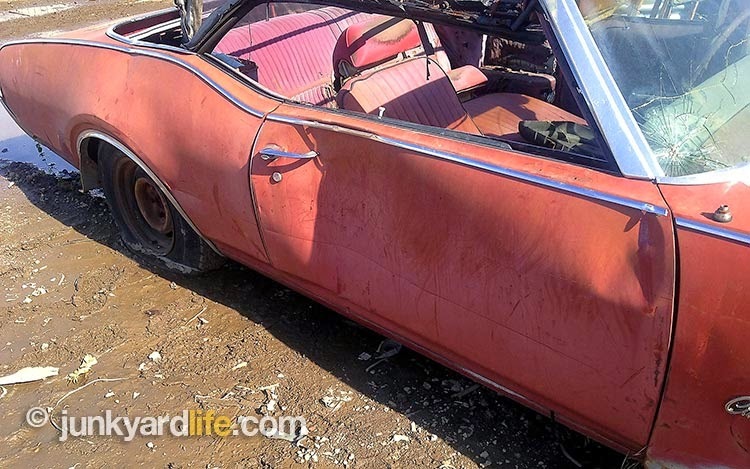 A new convertible top will make a huge difference in the appearance of this neglected ’69 Cutlass. Keith Lively stands proudly beside his latest hot rod project. 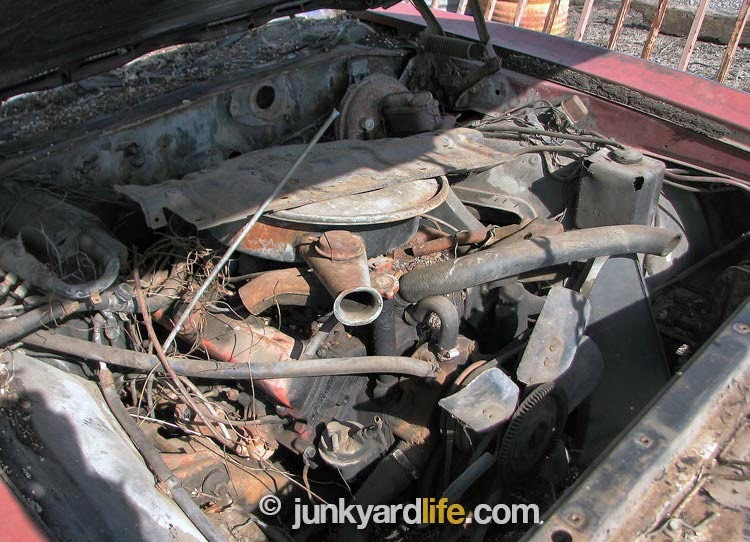 See his 1966 Chevy Impala, LS 6.0 AWD project here. 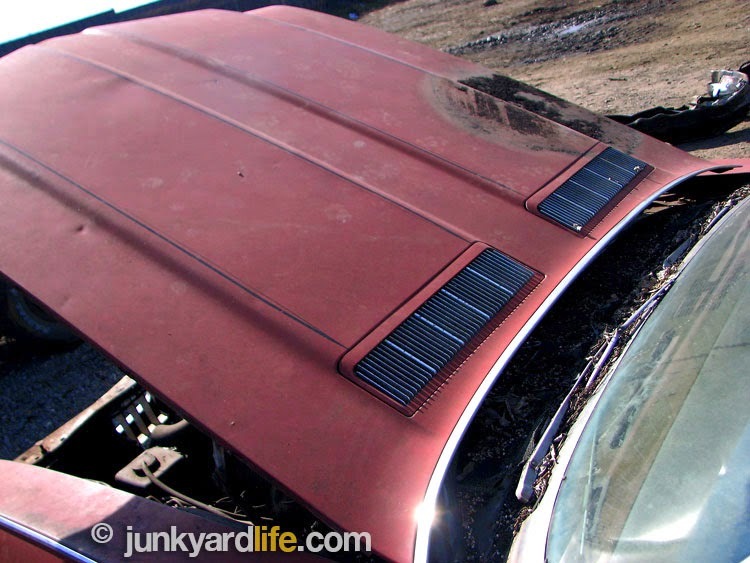 1969 Cutlass S hood with rear louvers, also used on non-Ram Air 4-4-2s. 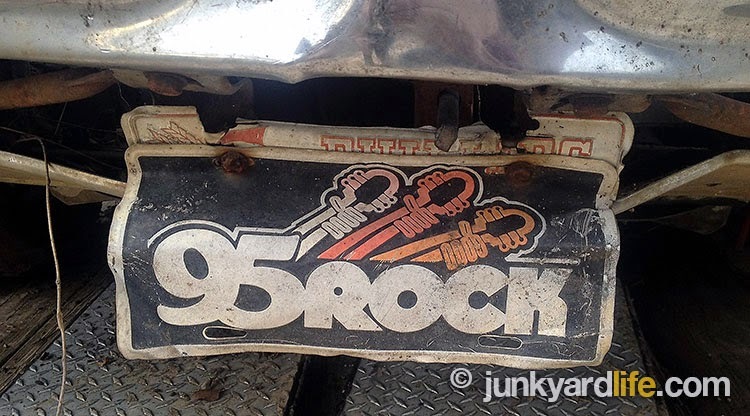 A vintage 95 Rock tag adorns the ’69 Cutlass. 95 Rock was ”the” Birmingham, Alabama rock station in the 1980s. Bright Cutlass S trim runs the length of the 1969 Olds convertible. A bit more air in the replacement rubber before she rolls off the trailer and the scrap yard treasure lands at its new home. Last time this 1969 Cutlass had a new tag – 1987. 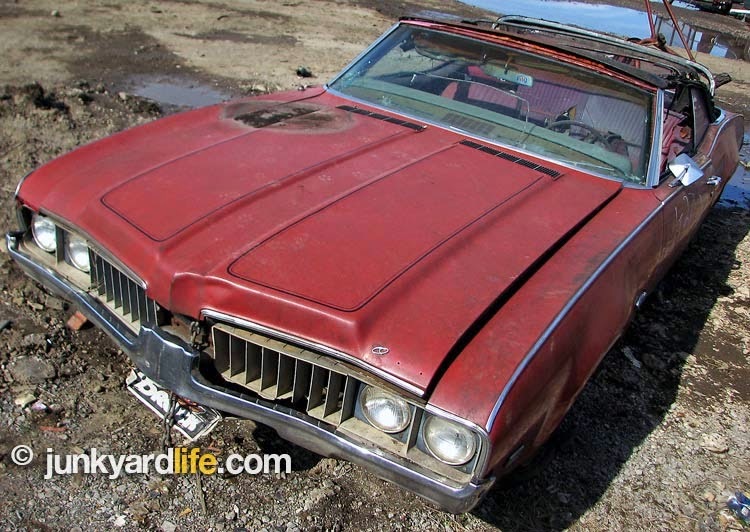 Would you have the guts to rescue this 1969 Cutlass? A lot of work ahead for Keith Lively, but he gets it – this is a dream car. One-of-13,498 V8 Cutlass convertible built in 1969. The journey begins again for this scrap yard refugee. 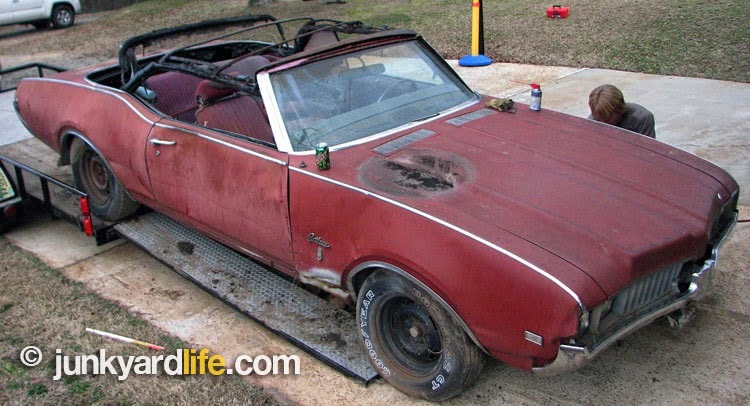 1969 Olds Cutlass S convertible in the new “before” picture.